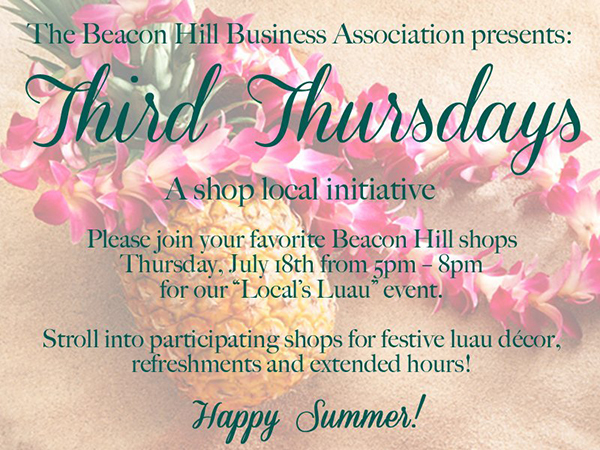 Join us NEXT Thursday, July 18th from 5pm - 8pm as we participate in the Beacon Hill Business Association's first ever Third Thursday! With a Hawaiian Luau theme, the event is sure to draw a crowd as participating stores stay open late and the neighborhood shops local. Stop by the gallery for a relaxing summer evening -- perusing new painting arrivals and sipping a surprise, festive libation! If you can't make it this month -- not to worry! We'll be doing it again on August 15th from 5-8pm with a theme of Summer in Paris.